May the Lord bless you for all your prayers and gifts, while we are working here in Brazil. First of all, we thank and glorify God that He helped us to do His work in Brazil. We don’t know how to thank God because He has blessed us with so much that we are enabled to do His work in Brazil. Looking back at the last few months, we were able to finish the construction of three classrooms in the Solidão church in June and now use the classrooms for the Bible study. 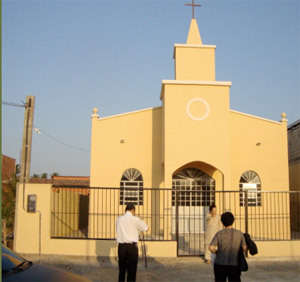 On September 14 we finished the construction for the Fortaleza church building (pictured above) in Northeast Brazil, and worshiped, thanking God with many Brazilian pastors and seven members of the Bethesda Korean Presbyterian Church in São Paulo. Now there is one more construction project, the Cutia church building started on June 19; Lord willing it will be finished the end of November. We also found a land to construct one more church building for the Agua Branca (in English meaning “White Water”) church at Tabira city, Pernambuco state Northeast Brazil. Soon we can start the construction for the Agua Branca Church building after making a contract with the land owner. We couldn’t believe all of these were humanly possible. How could we construct four church buildings in a year? Without a doubt, God gave us good contributors who had a mind for missions. We also believe that you have worked with us in the background as co-workers, by your prayers and faithful, sincere support. 1. Inaugurating a New Church! The inauguration ceremony for the Fortaleza Fundamental Presbyterian Church building which is located in Fortaleza city, Ceara state Northeast Brazil, was held on September 17 at 7:30 PM. More than 250 people were present at this inauguration worship service. Pastor Woo Sun Kim preached and many Brazilian pastors took part in service. Seven members of the Bethesda Korean Presbyterian Church in São Paulo were also present. 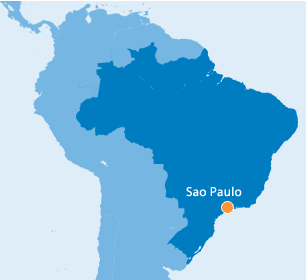 It is a long distance from São Paulo to Fortaleza, traveling four hours by airplane to reach the city. After the worship service was finished we had a feast to celebrate. Following the Fortaleza service we flew to Recife September 18 to visit the Bethesda Nursery in Garanhuns city, Pernambuco state. We started out early morning by bus from Recife, arriving at 3 p.m. We distributed dolls and sweets to the children who are studying at the Bethesda Nursery. Because of poverty these children have never gone to a public school. They are descendants of the Quilombola tribe. This Quilombola village was established by the Quilombola slaves who ran away from Brazil’s Imperial regimein the 16thand 17th centuries. About 206 families of these descendants are still living and 184 of their children are staying and studying in the Bethesda Nursery that we are operating. Eighteen people were baptized including eight children who were evangelized by the children of the Nursery. Their parents have started to open their doors to visits from the pastor and a preacher and to accept the Gospel. We are praying to God that He will help us and that the Holy Spirit will work in the hearts of those living at the Castainho village, to accept a Gospel and to grow as a Christian. We believe that God will do this work in the future through their sons and daughters who are studying in the Bethesda Nursery. Thank God as He has helped us to continue, without any problems in the construction of the Cutia church building, in spite of the drought conditions. The Cutia church construction has now entered the last phase of the work. Therefore, Lord willing, it will be finished by the end of November. So we are planning to hold the inauguration ceremony on January 5, 2013. An estimate from a contractor for the construction of the Agua Branca church has already been accepted, so we can start work when we will have the building site contract with the owner. We mentioned already in the last prayer letter about the donor for the construction of the Agua Branca Church building. The donor was a woman, president the New Life Saver Home, some distance from the capital city of Seoul, Korea. She wants to support the construction of a church building in Brazil in commemoration of her son’s wedding. Her son was married on July 7, 2012 in Seoul.